John Forbes Kerry and George Walker Bush during their student days at Yale University. The grade transcript, which Kerry has always declined to release, was included in his Navy record. 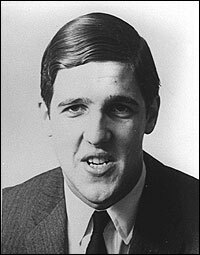 During the campaign the Globe sought Kerry's naval records, but he refused to waive privacy restrictions for the full file. Late last month, Kerry gave the Navy permission to send the documents to the Globe. Kerry appeared to be responding to critics who suspected that there might be damaging information in the file about his activities in Vietnam. The military and medical records, however, appear identical to what Kerry has already released. This marks the first time Kerry's grades have been publicly reported. In his Navy application, Kerry made clear that he spent much of his college time on extracurricular activities, including the Yale Political Union, the Debating Association, soccer, hockey, fencing, and membership in the elite Skull and Bones Society. Asked to describe nonschool training that qualified him for the Navy, Kerry wrote: ''A great deal of sailing -- ocean and otherwise, including some navigation. Scuba diving. Rifle. Beginning of life saving." He said his special interests were ''filming," writing, and politics, noting that the latter subject occupied 15 hours per week. Gaddis Smith, a retired Yale history professor who taught both Kerry and Bush, said in a telephone interview that he vividly remembers Kerry as a student during the 1964-1965 school year, when Kerry would have been a junior. However, Smith said he doesn't have a specific memory about Bush. Based on what Smith recalls teaching that year, Kerry scored a 71 and 79 in two of Smith's courses. When Smith was told those scores, he responded: ''Uh, oh. I thought he was good student. Those aren't very good grades." To put the grades in perspective, Smith said that he had a well-earned reputation for being tough, and noted that such grades would probably be about 10 points higher in a similar class today because of the impact of what he called ''grade inflation." 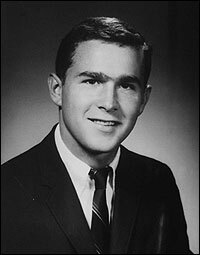 Bush went to Yale from 1964 to 1968; his highest grades were 88s in anthropology, history, and philosophy, according to The New Yorker article. He received one D in his four years, a 69 in astronomy. Bush has said he was a C student. Like Kerry, Bush reportedly suffered through a difficult freshman year and then pulled his grades up.